This little park model makes the most of its limited floor space. 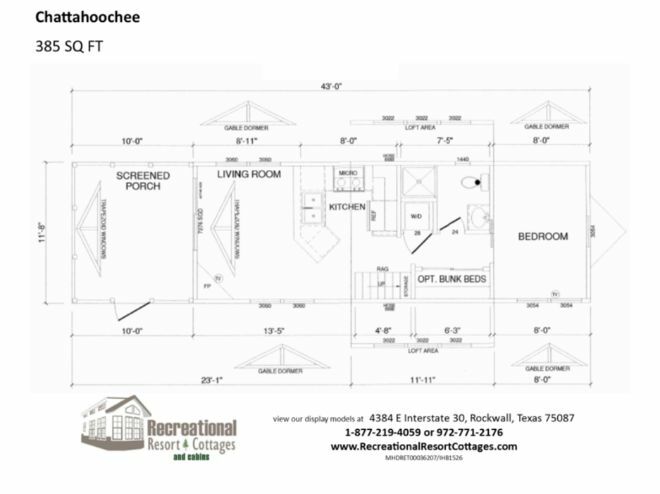 The Chattahoochee, sold through Recreational Resort Cottages and Cabins located in Rockwall, Texas, sits at 385 square feet (35.76 square meters). Yet it makes room for bunk beds, a loft area and a stone electric fireplace. If you ever wanted a park model that gets creative with floor space because you have a lot of guests, this is the model for you. The floor plan itself shows just how creative they got with this design. 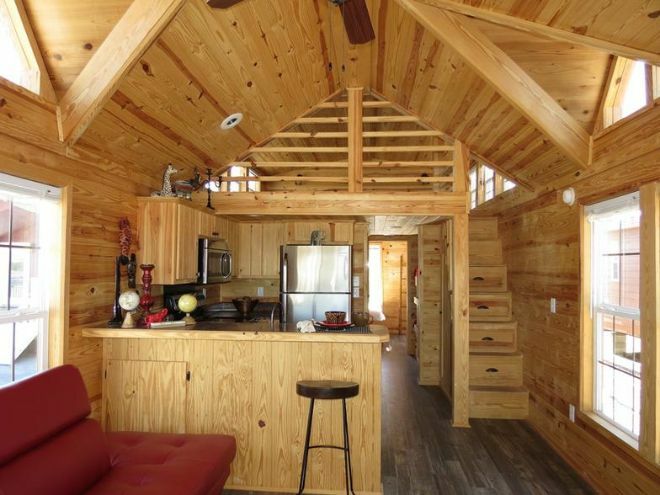 The most notable part is the optional bunk beds that are tucked right across from the bathroom and behind the stairs that are leading up to the loft. Even with the bunk beds, there is plenty of room for additional sleeping space in the loft, and there is still a master bedroom. The floor plan even makes space for a screened porch. 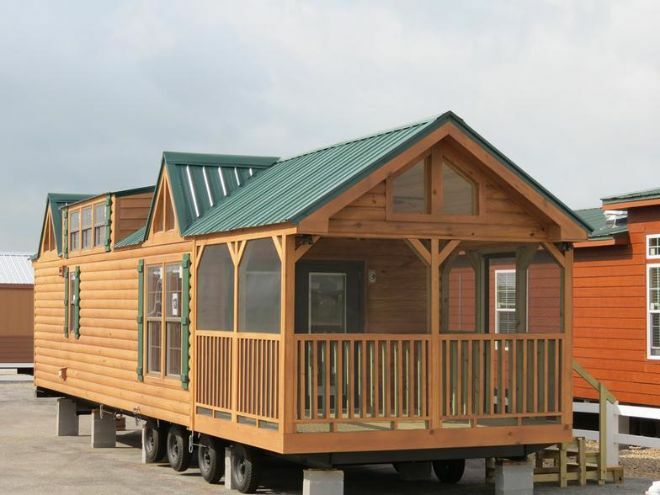 The exterior comes pleasantly classic, with its cabin-style wood exterior and green metal roof. The photo below shows the screen porch addition. This photo below shows how snug the layout is. You can just make out those bunk beds behind the stairs. The mostly open loft helps the space feel more open. An open kitchen space looks out into the living room, but a wraparound counter space is perfect for serving or dining. Below we see that there is just enough space for a full-sized sofa. Gable dormer windows add plenty of natural light. 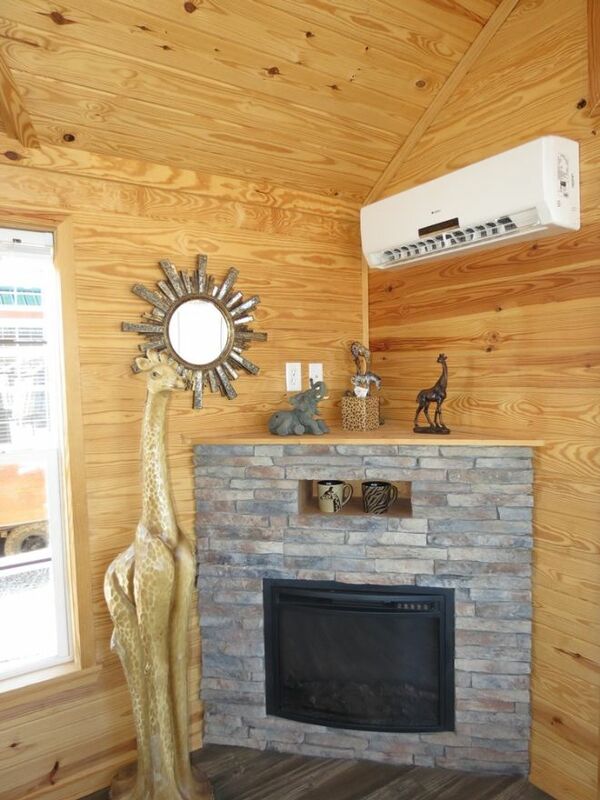 This electric fireplace gives the feel of a cabin and allows for mantel space. 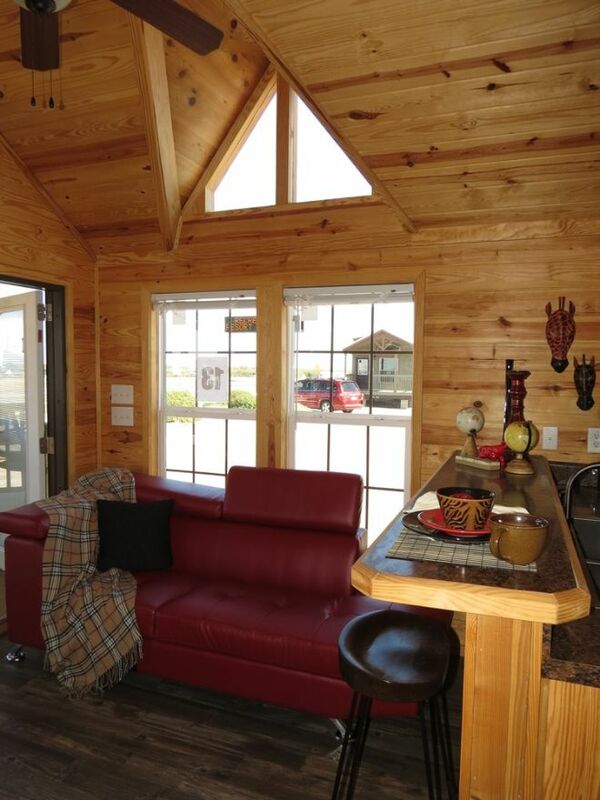 The knotted wood interior also lends to the rustic feel. 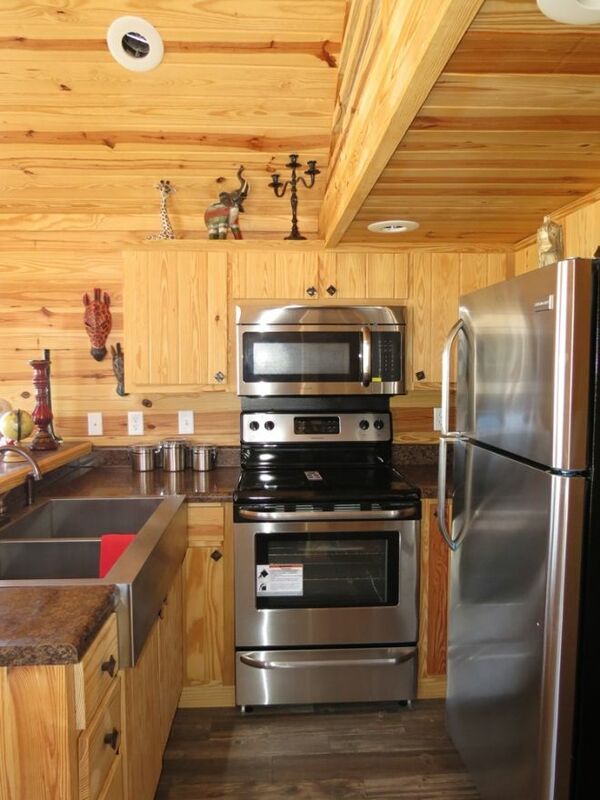 The kitchen comes with a full-sized refrigerator, oven and microwave. The stainless steel sink makes for easy cleaning. The wood cabinetry matches the rest of the interior nicely. 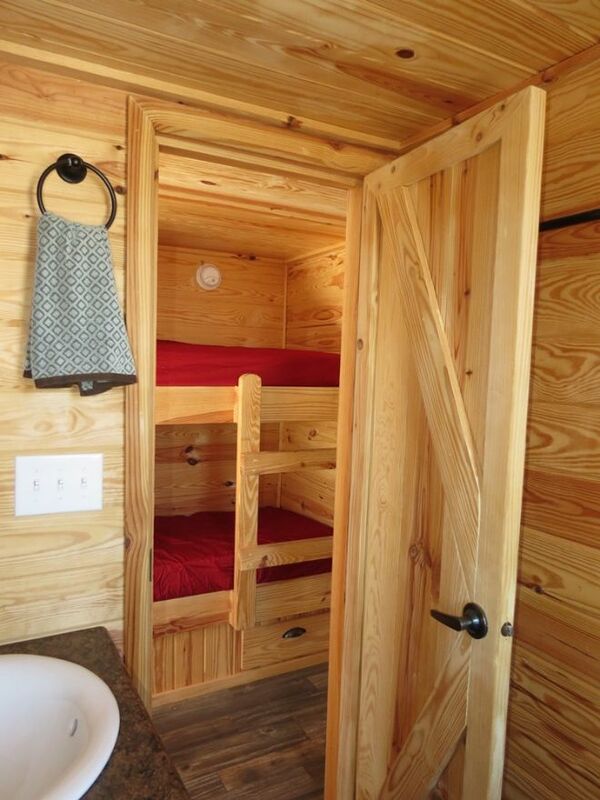 And finally, the photo below shows the cute bunk beds tucked away across from the bathroom. Like this creative floor plan? Don’t forget to SHARE it on Facebook!